Planning any corporate event requires a lot of time and attention, and Champion Charter Bus wants to help make the process easier with streamlined group transportation. Make sure your conference, trade show, off-site meeting, company retreat, or other corporate event runs smoothly with a professional and reliable charter bus rental. Our reservation team is ready 24/7 to help you plan your event when you call us at 1-844-693-9330. Champion Charter Bus is the West’s top resource for charter bus and minibus rentals due to our extensive network of bus options, which makes it easy to accommodate groups of any size. 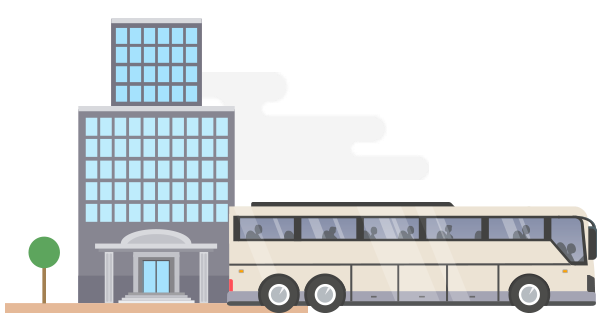 Whether you need a compact bus or an entire fleet of charter buses, we’ve got the resources to help you. Our bus rental options range from 18-passenger minibuses all the way to full-sized 56-passenger charter buses and anything in between, so our team can match you with the perfect bus for your specific needs. When you have to separate large groups, your event can easily become disorganized. If your attendees are new to the city, it can be difficult for them to find your venue and cause them to get lost. With a private motorcoach dedicated to your event, you can have your entire group ride to your event together, avoiding the need for them to branch off and travel on their own. Your attendees and employees may arrive late or not at all when they have to rely on public transportation, carpooling, or rideshare apps. With your own charter bus rental, you can easily shuttle guests from your headquarters or their hotel to your event at the AMA Conference Center in San Francisco on your own time to make sure everyone remains on your schedule. Your driver will always arrive 15 minutes early to ensure there’s plenty of time for loading, unloading, and other preparations for an organized, timely day. Corporate events mean time away from the office, and we all know what it’s like to still have upcoming deadlines regardless of upcoming events. When you work with Champion Charter Bus, you can request special amenities to ensure productivity on the road. Allow employees and clients to stay connected with WiFi and power outlets so they’ll never miss an email, meeting, or deadline while on the road. First impressions are everything, especially when you’re trying to seal the deal or impress clients. Champion Charter Bus works with the most professional, modern, and up-to-date bus rentals in the west to provide a luxurious experience. Impress clients and motivate your employees with an all-white or all-black interior, and request top-rated amenities like reclining seats, flat-screen TVs with DVD players, air conditioning, and more. Let your reservation agent know of any special requests, and they’ll find the perfect bus tailored to you. When your event has ended for the day, give your employees and clients the chance to explore the city and have some fun with a reliable shuttle service. When you work with Champion Charter Bus, your bus rental is yours for whatever activities are in store, on and off-hours. We’ll shuttle your group around town to local shows, attractions, restaurants, and more. Your trip is in your complete control, and we’re just here to give you a ride. No matter where you’re traveling to in the West, let Champion Charter Bus be a part of your journey. With services in major cities like Los Angeles, Phoenix, Beverly Hills, San Diego, San Jose, Denver, Las Vegas, and more, we’ll get you where you need to go with ease. Planning a long-distance trip somewhere else? We’ll handle all the transportation logistics so you can focus on your trip. Champion Charter Bus is the champion of easy, stress-free bus reservations. With experience arranging charter bus rentals for sports teams, weddings, school trips, senior groups, private trips, and more, we’ll show just how simple it can be. Call our 24/7 at 1-844-693-9330 to get started.